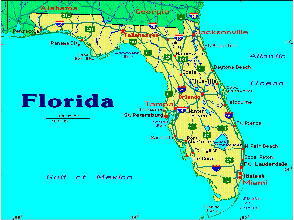 Most of Florida's lighthouses are on the Registry of Historical Places. Their maintenance is both private and public and involves federal, state and local governments for support. Some of the lighthouses are part of National Wildlife Preserves / Refuges while others are privately maintained. The 30 lighthouses along Florida's 2,276-mile coastline have been designed to fit the needs of a particular site when engineers found they could not build the traditional brick tower on the state's soft coastal sand. Large masonry towers are typified at the Ponce de Leon Inlet Lighthouse, St. Marks and Pensacola. Screw-pile lighthouses used in the Florida Keys stand on coral rock. Ironwork towers on the shoreline are typified by those at Sanibel, Crooked River and Cape San Blas. The Florida Cruising Guide to Lighthouses begins with the state's northernmost lighthouse at Amelia Island and proceeds down the East Coast, along the Florida Keys and up the Gulf Coast to the last lighthouse at Pensacola.